Today, it is fashionable to talk about water and its role in the destiny of the human race in the future. “Water will cost more than oil” is a common theme put forth by experts and scientists at global and regional forums and symposiums, and continuously expressed in their publications and speeches over at least the past 30 years. But, regrettably, this political science fad has not produced serious, circumspect projects and recommendations on what should be done and how. It must be acknowledged that at this point several fairly reputable publications with desperate alarmist forecasts have been published. In this context, Central Asia is no exception. The Central Asian countries are not the only ones to scare people with a predicted water confrontation. The Middle and Near East and Southeast Asia, to name a few, are all involved in a fight for water. Indicatively, these problems mostly emerge in states with a failing economy or lack of development. In both cases they become mistrustful of their neighbours. It is also necessary to much more clearly define the international legal statutes and legality of water use. The Central Asia countries need to reconsider such ill-conceived approaches to resolving water problems. I am convinced that we in Central Asia should sit down at a table, declare “a water truce” and start to develop the main principles, rules, procedures, terms and the resulting constants on water use in the interests of the entire region. This is a must because any, even the most insignificant move to multilateral regional interaction, not to mention water relations, should include the parameters of civilized international cooperation. In general, everyone understands that the development of international and interstate cooperation in Central Asia is today’s imperative. Obviously, the principles of international law, including equality, cooperation and justice, should form the foundation of water relations that should be based on and driven by a flexible but constructive compromise with full consideration for the interests of all sides. Global Environmental Ideologies: Can the Conflict between Humans and Nature Be Overcome? A gradual shift is occurring in modern world politics away from pure geopolitics and hard and soft power of sovereign states towards tackling global environmental, resource, demographic, and social challenges. Importantly, all participants in the negotiating process should remember that common regional interests, which are a multidimensional value for all Central Asian countries, can reveal themselves in identical or opposing views or both during the development of principles. This is not limited to general principles. Specific principles are also important. On the one hand, they supplement universally recognized standards, including international standards, and on the other they are independent as regards their geographical affiliation and regional norms regulating water relations. In this context, I consider it possible to study and use the principle of inter-sectoral balance of interests. In other words, agreements on water problems should be inseparable from those on transport, communications and energy issues. At the same time, it is obvious that attempts are being made to regulate the latter issues by international and interstate agreements that are divorced from reality both in form and content. It is clear that for Kyrgyzstan these sectors of the economy are mutually dependent, and, as we see it, inseparable from each other. If you look at the map of Central Asia you will see that the rivers Amu Darya and Syr Darya cover practically the entire region like a pair of pincers, as it were. There is not a single Central Asian country in which one of these rivers doesn’t flow. This fact makes all these countries interdependent. Seasonal characteristics, water volumes, changes in river beds or new canals or reservoirs change the natural basins of the rivers and can seriously affect the climate, water balance, glaciers and desertification, among other things. Therefore, the principle of compensation is extremely important for preserving the water-environmental balance. Aware of serious objections, I’d like to emphasize that the compensatory factor is important for all of the region’s countries. Specifically, water accumulation for the needs of people living in the lower reaches is compelling the states of the upper reaches to sustain certain direct and indirect losses. The latter should be compensated for by the efforts and funds of all countries involved, not only those in the upper reaches. For instance, the attention of all participants in “the water process” should realize that the region’s water resources are not limited to its cross-border rivers but also include many glaciers, other rivers, natural reservoirs and underwater resources that must be preserved for the countries in the region. But the disappearance of glaciers is a headache for the states in the upper reaches, with all the ensuing financial and material expenses. Is it “criminal” to discuss the need for the participation of all Central Asian countries in this process? It is obvious that the requirements of the states in both the upper and lower areas should be met by fairly divided resources throughout the region. This approach requires a serious and meticulous analysis and comprehensive adjustments in the event of any preliminary agreement. I believe it is time to form a comprehensive legal foundation with a view to using mountains as the most vulnerable environment for people. 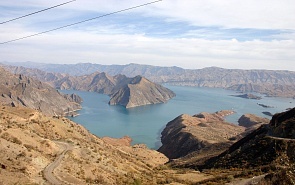 In this context, it would be useful for politicians, lawyers and other experts in all of Central Asia to think about the development and adaptation of an International Mountain Law that would have clearr main provisions and mechanisms on trans-border water resources and mountain-valley geographical links. It should be similar to the Aral Committee in which all these countries take part. All countries in the region should strictly abide by the relevant principles of a water partnership, as well as certain rules and procedures. Environmental Crisis and Political Dilemmas: How Shall We Live on a Warmer Earth? On December 12, the Valdai Club hosted an expert discussion on the global climate change, which was not, however, limited to the environmental dimension of the current crisis, but also comprised its political, ideological, and even philosophical aspects. Three different perspectives were presented during the event, giving an opportunity to look at the environmental crisis from various angles. For instance, there is an important rule to avoid the emergence of conflicts. Each country should take preventive action against the appearance of so-called “tension clots.” I think to achieve this it is necessary to establish a permanent roundtable, a dialogue venue or something similar that would meet at least once every three months to avert problems. It would involve representatives of governments, public organizations etc. In general, all Central Asian countries should pool their efforts to create a long-term mechanism for cooperation that will be based on a dialectical approach, intensive legal, political and other content and a flexible and dynamic set of instruments. The application of the rule on avoiding conflicts requires another rule: Don’t harm your neighbor. Planned actions, such as the construction of hydroelectric facilities, a change in river beds, the holding of military exercises and troop movements should be transparent and agreed upon. At any rate, information on such actions as well as bad weather should be accessible to the relevant services of neighboring countries. A rule on “talks above all” is justified in all cases. Naturally, I’m referring not only to official foreign policy or other government agencies but also to public organizations and public diplomacy. Regrettably, public diplomacy has certain limits just as the official one does, although their limits are different. Therefore, comprehensive use of all possible options is certainly rational. Understandably, the number of principles, rules and procedures is larger than those that are mentioned in this article. It is necessary to take serious joint efforts to build a civilized international space in Central Asia. Trying to win cotton independence during the 30 years the USSR neglected (deliberately or not is another matter) the issue of the water balance of the Aral Sea that practically stopped receiving water from the rivers Amu Darya and Syr Darya and gradually dried out by three quarters, which in turn led to serious changes. First, the climate has changed in all Central Asian countries, including a higher frequency of sand storms, the clogging of glaciers, desertization, etc. Second, monoculture imbalance in the economy had a fairly sad effect on the professional, economic and humanitarian orientation of the local population, for example, the disappearance of the fishing industry in the Aral area. Third, there have been demographic changes, including the settlement and movement of people in the region adjacent to the Aral Sea. Last, the Aral Sea tragedy is a global environmental disaster that is, unfortunately, not infrequent on Earth.